otherwise know as Kathy's corner! Having been a paranormal investigator for approx 15yrs now and of course had an interest that goes back to childhood stories I could bore you with, my interest has also expanded to include Parapsychology. In this space I shall be introducing all things 'Parapsychology' from my point of view. I say from my point of view I shall at time be sharing other's views. 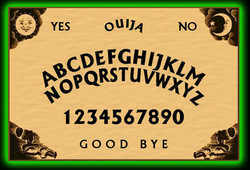 I am by no means an expert in Parapsychology! my only claims to knowledge on the subject come from two 'dodgy' parapsychology courses a fair few years ago and more recently from Dr Ciaran O'Keeffe's School of Parapsychology online courses Foundations of Parapsychology and Intermediate Parapsychology. The first of which gave me a basic knowledge of history, methodology, key figures and an underpining knowledge of key ideas/research on subjects such as telepathy, precognition etc and how to critically assess information. Aimed at undergraduate level but open to everyone the courses provoke critical thinking and methodology by the student. The Intermediate course involved much more indepth reading and understanding of research/ideas ending in writing our own research proposal, which was the cause of many a sleepless night! (when I look back it's funny as it was purely that there was so much to think of and so much choice for the research proposal it was hard to narrow it down). However it was well worth the effort and although not easy is achievable even without previously having studied at University level. i am proud to be able to say I was in the first handfull of SCOP students to take the intermediate course (and pass).